Three Traces of Oscar. 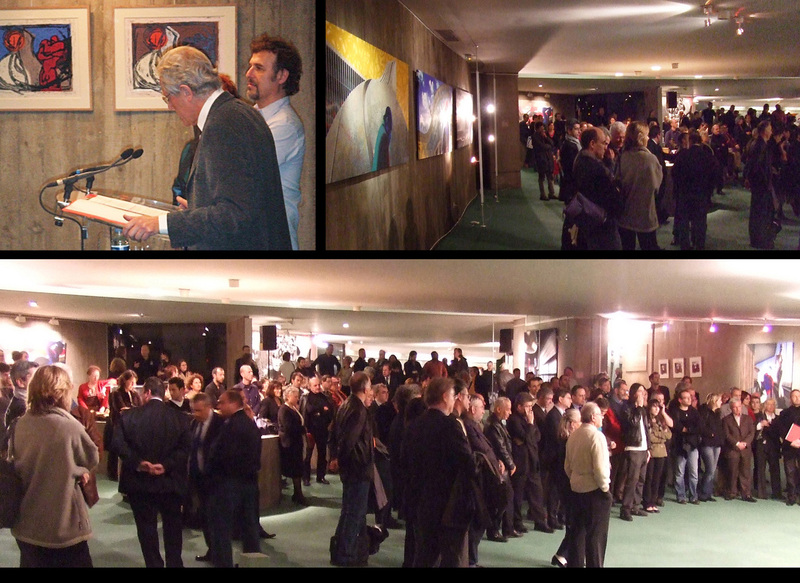 The exhibition. 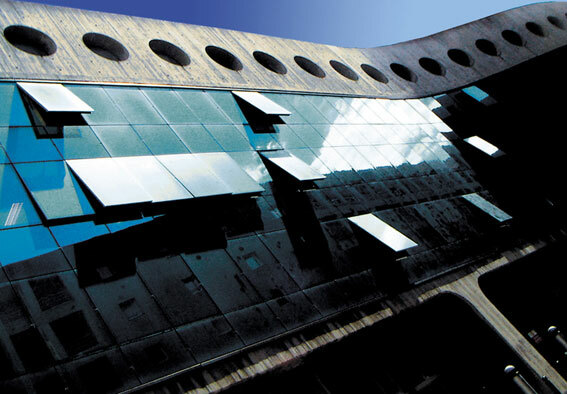 Between 1967 and 1990, Oscar Niemeyer, artist, poet, philosopher, writer and as it happens the most innovative and moving architect of the Twentieth Century, created three sites in the Paris Region: the French Communist Party headquarters in Paris, the Bobigny Trade Union Center and the head office of the daily newspaper "L'Humanite" in Saint-Denis. These three "Parisian" buildings were the inspirational source for the works grouped under the title of "Three Traces of Oscar." 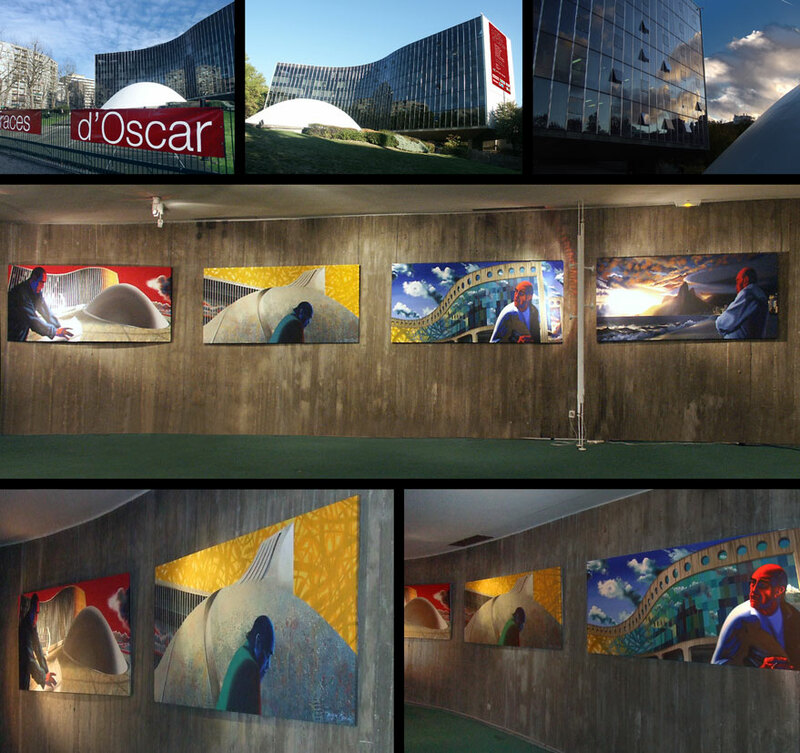 Thus, from November 18, 2006 to March 31, 2007, the exhibition "Three Traces of Oscar" took place at the Espace Niemeyer (that is the exhibition hall of the headquarters of the French Communist Party located in Place Colonel Fabien in Paris), presenting a collection of twenty-eight large canvases and a series of monoprint engravings. 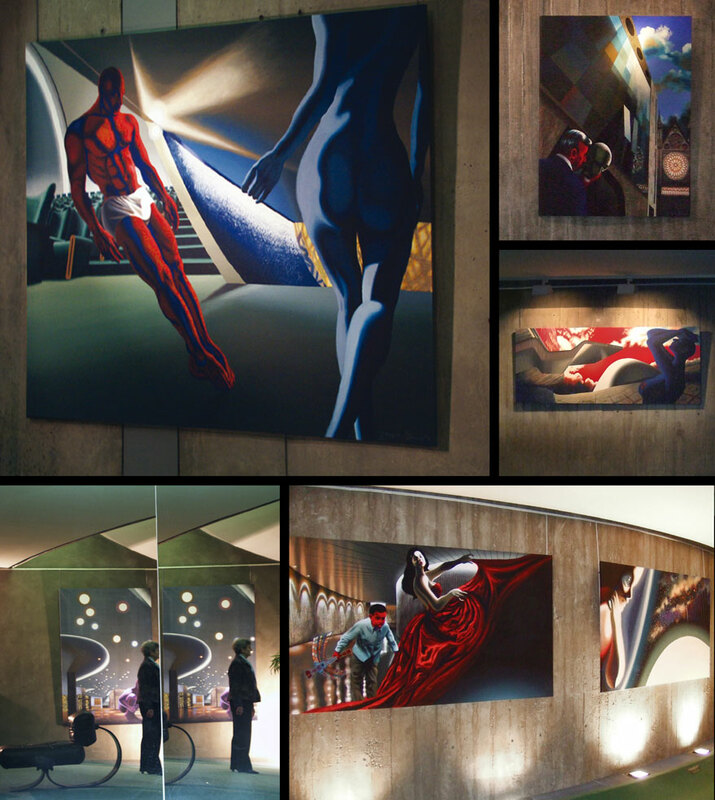 Some of the paintings in "Three Traces of Oscar" helped to further unexpected encounters between the Brazilian architect and other artists ; musicians, songwriters and performers such as Joni Mitchell and Kate Bush, and filmmaker Stanley Kubrick. 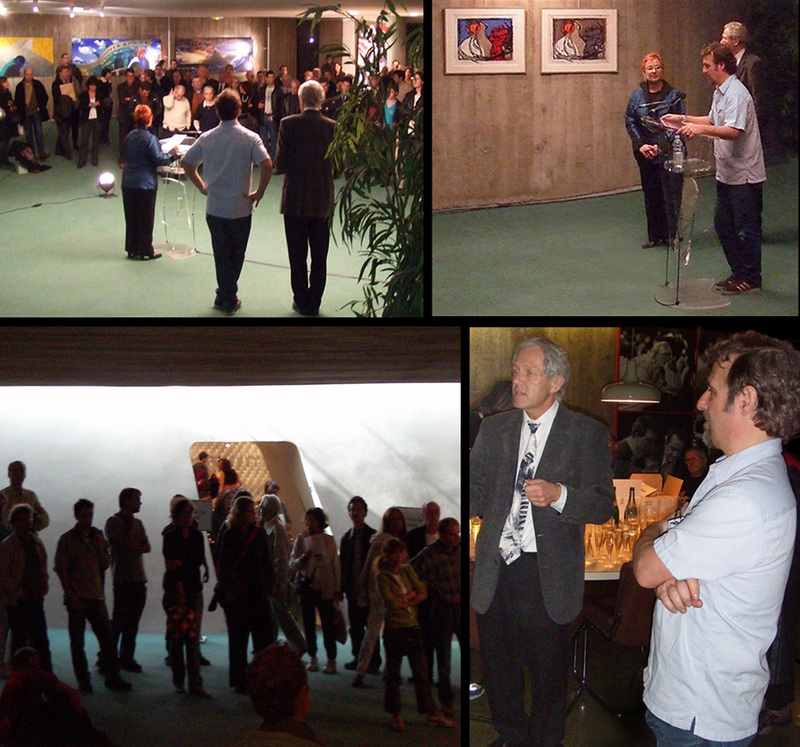 These meetings are a symbol for some strong artistic similarities between Niemeyer, Mitchell, Bush and Kubrick, among which one could quote primarily the singularity of an unusual and unique artistic œuvre, that each of these four artists has developed in concerned respective discipline -music, architecture or film. And also a personality characterized by a demand for excellence, and a refusal to compromise at the level of the artistic achievement that they have searched and imposed, throughout their artistic journey. 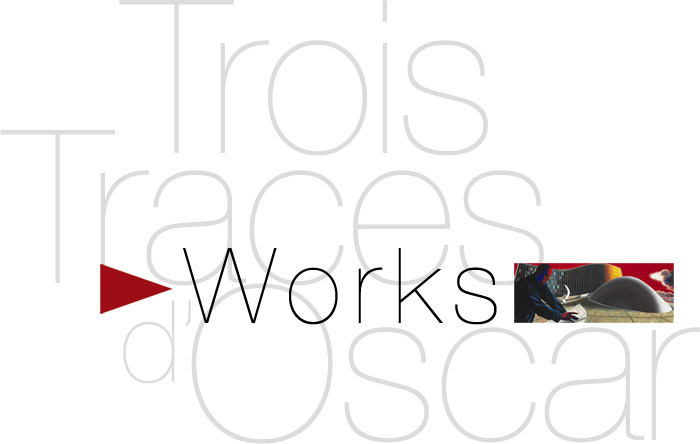 Many thanks to Gérard Fournier who made "Three Traces of Oscar" happen. And to Yvette Chapochnik as well, for being always there. Excerpt from the exhibition catalog. 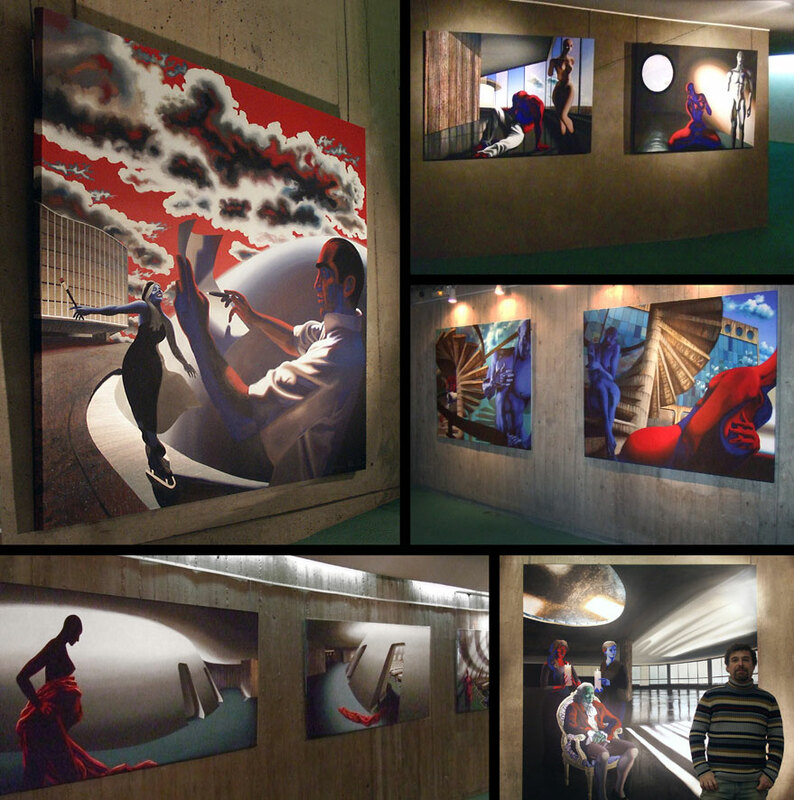 (...) In these paintings, I wanted to conjure up the three buildings from every aspect. I didn't want to favor exteriors over interiors, or leave out lesser known aspects simply to highlight what is already widely familiar. I wanted to pay homage to all these "bits of buildings" that it would be so easy to ignore out of laziness, despondency or blindness. 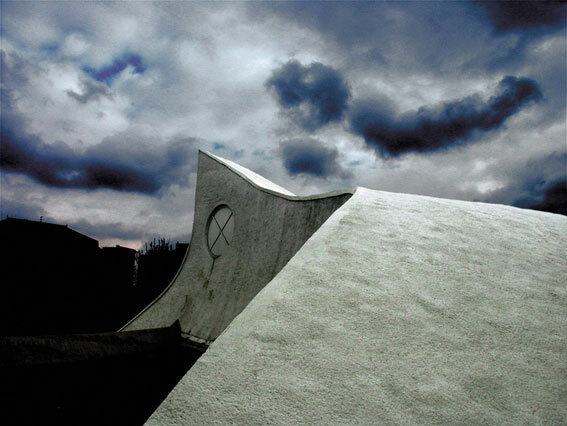 But had they been left out, they would inevitably have upset everyone who knew Oscar Niemeyer's work – and they are legion. So there were as many paintings and interpretations as there are facets of his work. That, at least, is what I tried to achieve. Naturally when I look at the entire production today, I realize this is not really true, since it was impossible given the time available (under twelve months), and the scope of the enterprise. But I had to start somewhere and decided to undertake the whole project, since you can only hope to recreate a little of the original dreams that stir up the soul and inspire you to wield canvas, drawings and colors by setting the stakes high. The challenge of the empty page of the imagination, the virgin canvas. 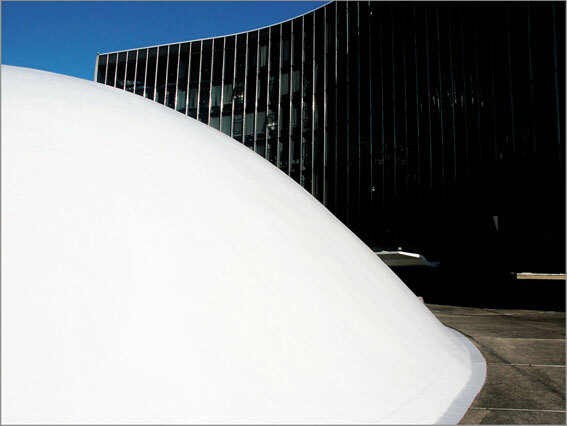 These paintings, then, had to reflect all the angles and curves imagined by Oscar Niemeyer. I imagined them where possible as offering surprises in their approach to the buildings. I also wanted to appropriate for myself the places I explored (any artistic project needs a minimum of ambition, it seems to me), but it was also important for me that they should be extremely precise. Let me explain: I mean precise in relation to the proportions, dimensions, materials, colors and aspects imagined and intended by the architect. I would draw on fantasy, unpredictability, poetics, violence, paradox, symbols, living things, sensuality, and every other form of creative humus, and some of t<<hese would as usual use me – rather than the opposite. But there was something I absolutely refused to compromise with. The precision with which I rendered these places. When you are lucky enough to paint about such a subject, working with such materials, and about such an exceptional architectural opus, this is the least you can do.